Temporary and bottom-up urban projects are just a cover-up for failing governments. These days there is a strong belief among spatial professionals in a certain type of spatial intervention, often described using terms such as ‘bottom-up’, ‘tactical’, ‘guerilla’ or ‘pop-up’ urbanism. These interventions are modest in size, focus on one specific locality and are generally implemented by freelancing spatial practitioners, small companies or collectives, often given a bit of subsidy, but hardly ever structurally supported. This type of ‘urbanism’ is also often temporary, to some extent characterised by the flexible (re-)use of structures and materials and organised the DIY-way. Obviously these kind of interventions have always existed but they have become more important in the spatial professions since the 90s, as local and national governments have gradually withdrawn from both large scale planning as well as local service provision. The multiple crises of the last decade have led governments to choose for more austerity, further undermining their own influence on spatial production (and an equitable society). However, it was the short period at the height of these crises, when the market temporarily suspended many large-scale projects, that the small-scale, bottom-up spatial interventions were elevated from niche to mainstream practice. While in promotional materials and in the media often portrayed as cute, likeable and featuring smiling locals, these kind of spatial interventions have also been subject to a considerable amount of criticism. First of all, the actual impact of these projects is often overestimated. Although the proponents of the pop- and bottom-up believe in the idea of ‘urban acupuncture’, referring to the wider impact a local intervention can have, in practice the actual effect remains limited to the most local scale, involving or reaching out to just a handful of locals. On top of that, the ‘scalability’, the possibility of scaling up such a project beyond its most immediate surroundings or replicating it in other areas, is often minimal due to the specific local conditions of the project, such as this single vacant plot or that exceptionally active and tightly-knit group of inhabitants. Worse than the modest results however, is their possible negative impact. These projects might in fact have a segregating effect, since it is only the skilful, the networked and the capable who manage to connect and involve themselves such that they are in a position to reap the benefits of a particular opportunity. Those who need it most, such as the elderly, the disabled or the socially challenged, remain cut off. At the same time, many of these projects are filling in the gaps left by negligent (local) governments, which are either unable or unwilling to provide for their citizens. Over the last decade, it has been the voids left by sudden, devastating cutbacks where ‘do-it-yourself’-urbanism has most frequently stepped in. All kinds of services, from elderly care to neighbour assistance, are now carried out by often unpaid, well-meaning volunteers instead of professionals. ‘By celebrating these projects’, wondered Ella Harris and Mel Nowicki in The Guardian, ‘aren’t we simply distracting from the lack of structural public provision in these areas – and worse still, normalising, even glorifying, its absence?’ They might well be right, (local) governments will most likely be pleased to see that they can get away with formerly expensive services now being supplied for free. Another reason for local governments and developers to stimulate these processes is that, without much investment from their side, the efforts of the pop- and bottom-uppers will probably boost an area’s reputation, creating cultural value and usually upping property values as well. However, even if these ‘tactical’ interventions function properly and have some positive effect, their dependence on volunteers or incidental subsidies, make them highly vulnerable: they might pop-off as quickly as they popped-up. Self-built dwellings in Buiksloterham, Amsterdam. Despite all these drawbacks, the cult of pop-urbanism has been flourishing for quite a few years now and still seems to be gaining in popularity, especially among local governments beyond the more obvious ‘innovative’ cities. While this year’s International Architecture Biennale Rotterdam does highlight various large and ambitious projects featuring entrepreneurial governments and large investments in energy and infrastructure, it also includes, as we described in our previous article, many projects where new coalitions of individuals and collectives step in for a conspicuously absent government. While not all the aforementioned criticism applies to every one of these projects, it definitely helps to perceive them in a more critical manner than they are often presented. Clear examples we have already mentioned are for instance the temporary ‘Parckfarm’ project, a ‘spontaneous, participatory experiment’, creating a neighborhood center on a removed train emplacement, or the collaboratively organised housing project ‘Warmbachliweg’ in a former waste incinerator in Bern. The IABR further features various ‘labs’ around the world, such as the ‘Afrilabs’, essentially co-working spaces in various African capitals, or the RioLab, a studio where citizens can meet to discuss possible incremental changes in the surrounding favela. Other projects do clearly transcend the most local scale, but are still evidently ‘bottom-up’, with a government that plays no or just a modest, facilitating role. 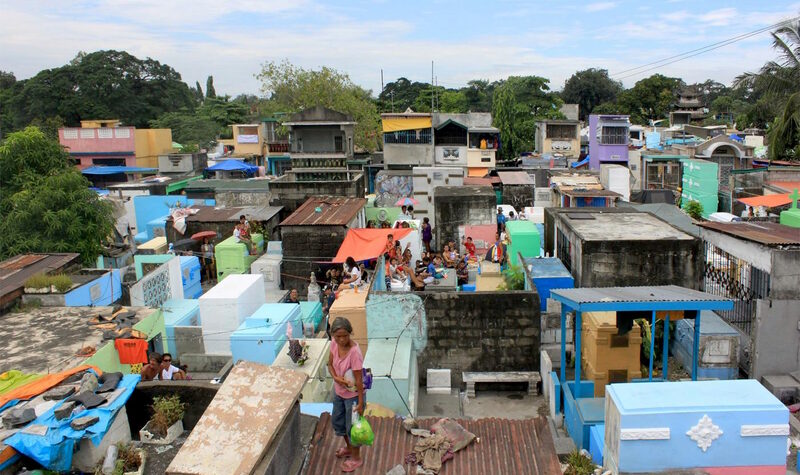 Among them are cases from many ‘informal’ neighborhoods around the world, such as the ‘Suame Magazine’ area in Kumasi, where people have created an informal recycling area for European vehicles, or the ‘Living Necropolis’ in Manilla, where thousands of people have created homes for themselves among the tombs of a cemetery. 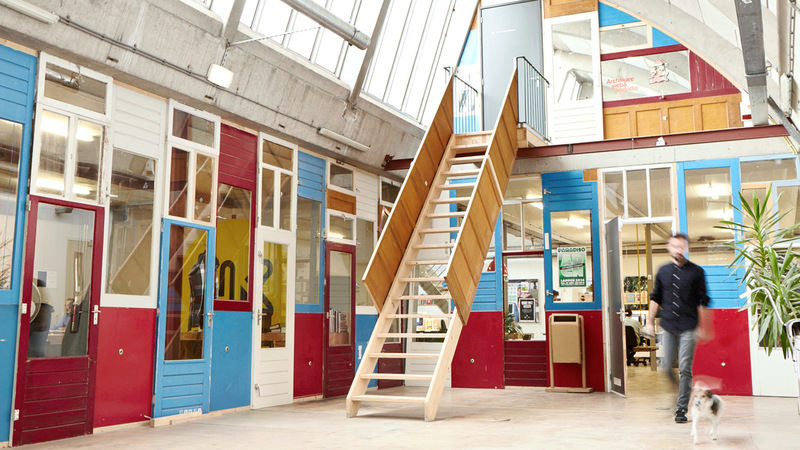 Back in Europe, there is a very different type of ‘self-building’ that has received a lot of hype, of which ‘Living Lab Buiksloterham’ in Amsterdam is an interesting, multi-faceted example. While housing associations used to provide the bulk of the housing target, here a dedicated army of self-builders is doing the job. Although the first results are promising, many European self-build projects have a clear middle-class bias. The IABR atelier focusing on Utrecht might contain one of the most poignant examples however. 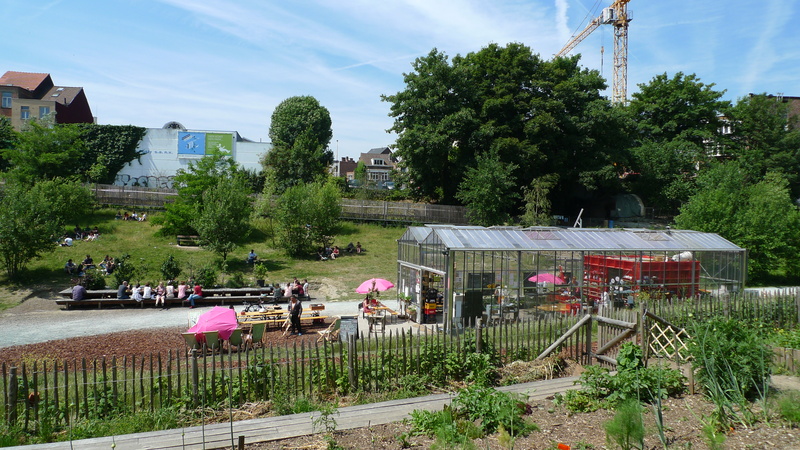 While it acknowledges as a given the last decade’s drastic budget cuts on health care in the Netherlands , it curiously suggests the well-functioning, local, bottom-up community center ‘Vechtclub XL’ as a solution. It is ‘made possible by crowdfunding and entrepreneurs driven by value creation rather than profit margins’. But, according to the catalogue, ‘it remains to be seen whether Vechtclub XL can survive in the long term. The club is after all merely the temporary tenant of a vacant property where many dwellings can be built’. A lot of these cases are featured in the IABR–2016 brochure ‘POWER TO THE PEOPLE!! !’, which through an exhibition tour provides one of the many ways to explore and understand this year’s biennale. However, when individuals, collectives and small companies collaborate to create small projects which provide communities with their most immediate needs, such as housing or a neighborhood center, do they really acquire a position of power? Even if they manage to have more than just a minimal impact, most of the cases still fit perfectly well within the urban development framework envisioned by the authorities and even soften the problems created by their decrepitude while in no way confronting the current, problematic direction of spatial production we described in a previous essay. The pop- and bottom-up interventions almost always remain incidental, isolated and dependent on institutional good-will, and will therefore have a hard time becoming an actual ‘counterpower’. It’s important to understand that the future development of cities will be a power game, and incidental interventions by citizens with spare time will not have enough leverage to enforce structural change. Such bad logic...Living in London for a year was enough to make me groan at anything with "pop-up" in the name. But this article makes too many mistakes in its critique, starting with confusing bottom-up with pop-up. It's a bit like confusing architecture with a building and then concluding that because a certain building is bad, then architecture is bad, and therefore all buildings are bad. Wrapping up all bottom up initiatives as "pop-up" is not only conceptually inaccurate, it is factually inaccurate. 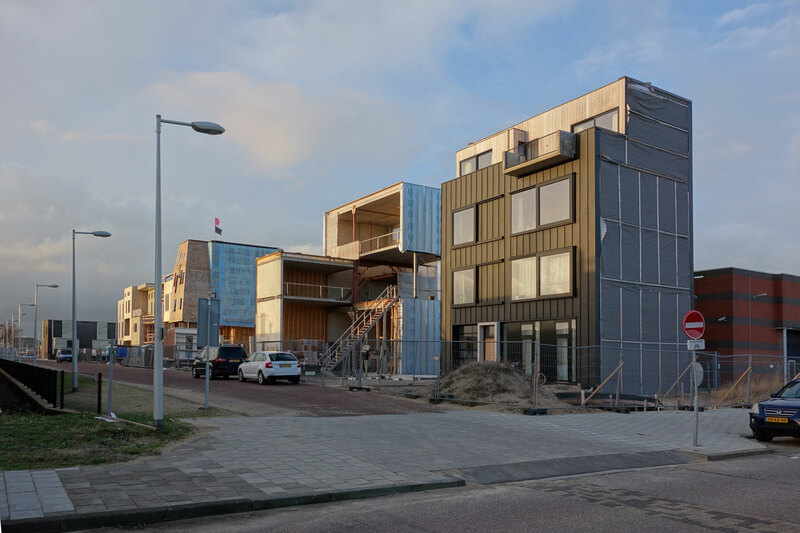 There is nothing pop-up about the self build project in Amsterdam. The homes will be there for decades to come. And complaining that the project is a symptom of the failure by social housing associations to provide appropriate housing is a fundamental misreading of housing provision and its history in the Netherlands. 'Those who need it most, such as the elderly, the disabled or the socially challenged, remain cut off.' Sorry, but have to disagree. If you think about an all inclusieve process, you wan-t bump in these problems. Further, aldough these -city acupuntural- projects might be temporary solutions, they are so to a bigger world economic, western centered, crisis. These responses are a breath of fresh air in a suffocating environment. People that try to take care of themselves are actually activating a mechanism that whitout their presence wouldn’t run. What shall I do as a mother, where I see there is nothing for my kid in my surroundings and my kid is growing…. Comparing activities in Africa or Manila to ones that are in Europe is slightly infantile, similarly to position our continent suddenly on the same economical levels. We are doing -bottom up- out of our free time, while in other continents they are doing it our of strong surviving needs….so yes, maybe IBAR examples are -inspirations-. ‘It’s democracy, stupid!’…well is not ! Is capitalism ! I strongly agree with this article. One thing I would like to add, in regard to the impact of these projects: the personal impact is hardly ever mentioned but should not be underestimated. Though dominantly middle class, these projects are often a mix of influential and less connected people. For the latter it can be very instructive to be part of such a project. It provides them with role models and a network, and these projects often help people start their careers. These projects can also give people the confidence and tools they need to change their own situation. Then again, these effects make the need for these projects to be more open and less vulnerable even more pressing. Yes, yes and yes. Also look to local, volunteer projects established to help people who are currently classified as refugees to see how problematic this mode of spatial production and civil society engagement can be. Many "helpers" find themselves in a destructive cycle of self-exploitation in an effort to replace what their governments refuse to provide. Volunteer help is good, but it cannot sustainably replace major institutions.